Aurora catalog # IX4-S-121B-BF, Turbine Pump End Only. Cast Iron body, and Bronze impeller. Seal: Buna Mechanical Shaft Seal. Ports are : 2 Inch NPT Inlet Port, 1-1/2 Inch NPT Discharge Port. Aurora regenerative turbine pumps are field-proven throughout the world. Aurora turbine pumps are ideal for handling high head/low flow requirements, liquids entrained with gases and vapors, and constant flows. 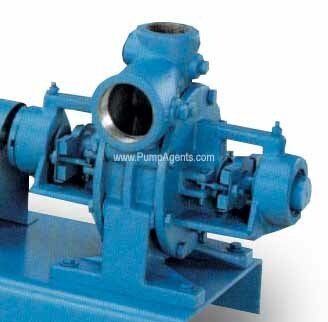 Aurora pumps are designed for those special applications where high head and low flow are required by the system. Boiler feed systems, for example, require high pressure to get low flows of water into the pressurized steam boiler. The constant flow characteristics make the Aurora turbine pump ideal for cooling systems where it is vital that sufficient flow is maintained to dissipate heat despite changes in pressure. With Aurora pumps, you can always depend on the same capacity despite variations in head pressure and achieve increased system reliability. 2 Inch NPT Inlet Port, 1-1/2 Inch NPT Discharge Port.